"Based in the heart of Exeter's bustling quayside development, Samuel Jones offers comfortable casual dining and drinking with a fresh and contemporary urban feel." This area of the quay has also been host to many failed night clubs, pubs and restaurants. This particular venue has been left empty for a long time so when I heard that St Austell Brewery had injected over a million pounds to turn it into a new pub restaurant, I was excited to see their vision. St Austell has been a family brewery business since 1851, based at St Austell, Cornwall. They produce a range of cask ales that are supplied 150 tied houses. Samuel Jones is their latest venture and from the minute I looked at the website I was impressed to see that they had really done their research. Samuel Jones, one-time JP, Alderman, Sheriff and Mayor of Exeter, was a man of the people who worked to bring clean water, regulated power supplies and improved healthcare to those who lived in the city. 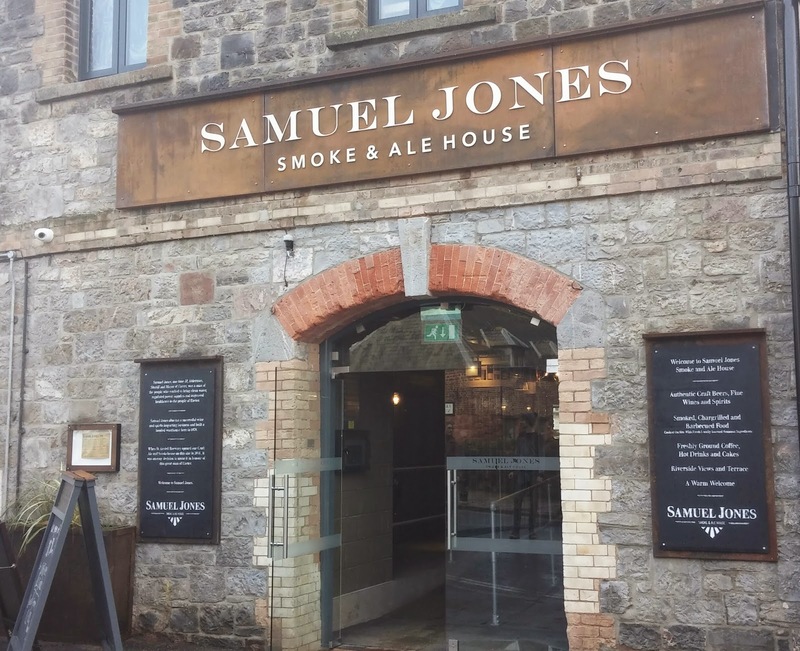 The warehouse location for the pub restaurant was Samuel Jones’ physical legacy to the people of Exeter, as he intended it to revert to city ownership at the end of the 31 year lease taken out by his company, W.L. Jones and Sons in 1878. The site was previously owned by the Devonshire Cider Company and housed a marine store and a rag depot before Samuel’s outlay of £2,000 created the building the restaurant occupies today. The inauguration of the warehouse was the event of the year, with the Mayor and elected officials enjoying a feast memorable enough to be mentioned in the Exeter Evening Post 22 years later! The family of Samuel Jones were invited to the launch of this restaurant, and were so happy to see his legacy kept alive. The outside is smart but also in-keeping with the surroundings. It has been cleaned up and looks very welcoming, a million miles away from the empty warehouse that has been there for years. The inside has a very strong contemporary yet urban feel with bare brickwork and lots of wood, and I love the massive bar centre piece. 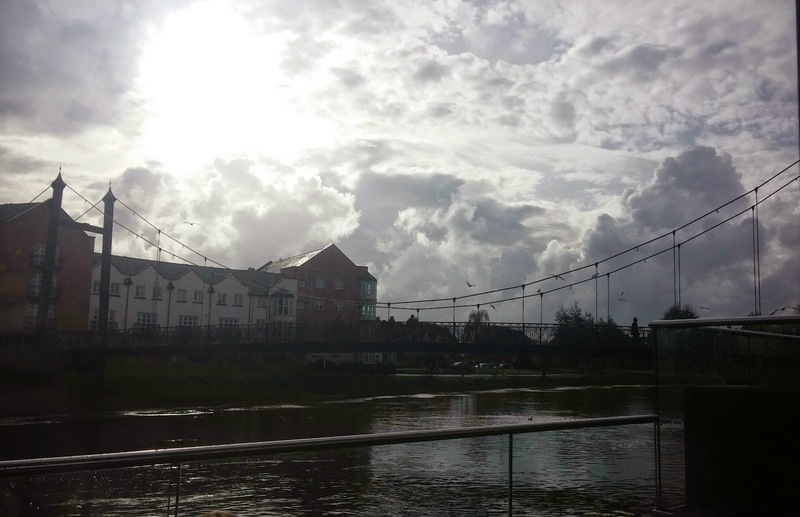 Due to it's unique location it boasts some impressive views out over Exeter's historic quayside. They have made the most of this with lots of seating available outside, which will be perfect for the Summer. Sadly the weather wasn't that great when we went, but what a view to eat your lunch to! We went on a Saturday lunch time and the venue was packed. Our waiter was very helpful and explained the menu and drinks on offer. We went for a local strawberry & lime cider that was absolutely delicious! Their entire menu shows that, where possible, their chefs use fresh local produce, cooked on the premises to create their meals. Their ingredients are grown, reared or caught in and around Devon and Cornwall and they minimise the use of pre-prepared food on their menu- an instant thumbs up from me! They also have an exclusive robata coal grill which means they can produce amazing smoked and slow cooked meats. I decided to go for something that normally I avoid when I see it on the menu. The reason for this is that I have never had a nice one when eating out- a macaroni cheese. 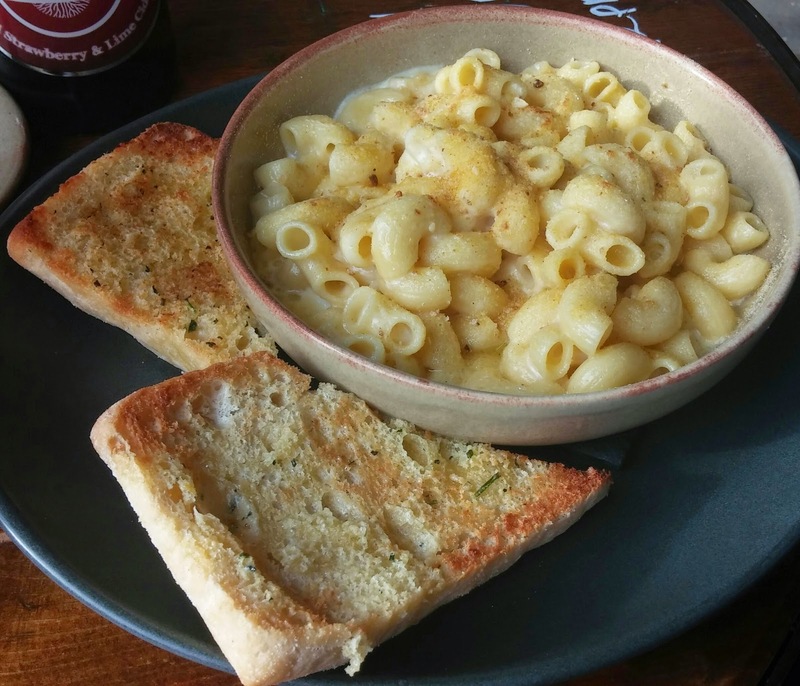 Their macaroni cheese is made with truffle oil, savoury topping and roasted garlic bread. This is easily the nicest macaroni cheese I have ever had in a restaurant. There was lots of cheesy flavour and the truffle oil really sets the dish off. I really enjoyed it and the garlic bread was perfect for mopping up the delicious cheese sauce. The macaroni was lovely and rustic chunky! Nick really struggled with what to choose. The daytime menu is simple but each individual thing sounded so delicious! There are hot dishes as well as a selection of sandwiches. In the end he chose to test the robata grill and went for Beef Brisket- smoked and cooked for 14 hours served in a brioche roll with smoked tomato & pepper salsa and some chips. When he bit into it there were lots of positive groans. He said that the beef literally melted in the mouth and it was the best he has ever had! The chips were chunky and perfectly crispy on the outside and light and fluffy in the middle. A refreshing change is that their sauces on the table were not your standard tomato ketchup. The bottles were "handmade in Devon" and offered smoked garlic and tomato or spicy tomato sauce. The garlic one was next level... so delicious in fact that I had to have some on my plate to dip my bread into! We were showed the pudding menu, but as delicious as it looked we couldn't fit anything in. 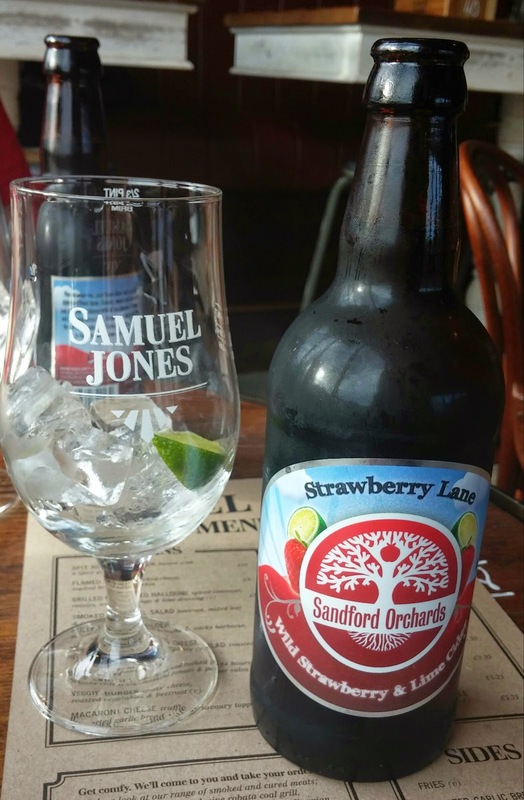 We were really impressed with everything about Samuel Jones; from the rich heritage being kept and promoted throughout, locally sourced and fresh ingredients to the helpful and attentive waiting staff. The location is fantastic and an amazing atmosphere to eat in. I can't wait to go back and try out their evening menu!